Biking over 4,000 miles in just 70 days may not be your ideal pastime. For a group of students from Texas, it’s how they choose to spend their summer vacations. 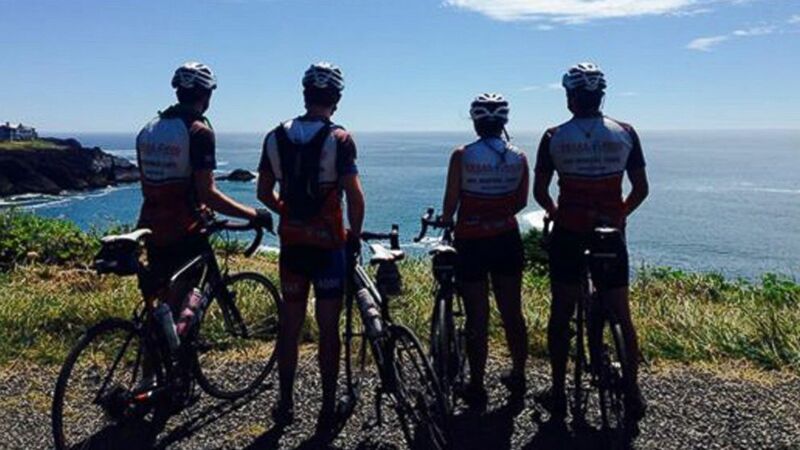 Students from the University of Texas bike ride from Austin, Texas, to Anchorage, Alaska, — all in the name of fighting cancer with Texas 4000. The organization raises money and each biker rides for something greater than themselves. One of this year’s riders, Courtney Schutze, joined Texas 4000 after feeling disconnected from her dad’s battle against multiple myeloma. While she was at school in Austin, her dad was home in Dallas fighting for his life. She said Texas 4000 seemed like an outlet to be a part of his battle. “I came into this thinking I would be fighting my dad’s fight with him. But I lost him, so it became a fight in memory of his fight,” Schutze told ABC News. Texas 4000 was founded in 2004 by UT students, Chris and Mandy Condit. Chris Condit, a cancer survivor himself, wanted to have a ride within the United States that was from one point to another, so he thought of Texas and Alaska, two of the largest states, Program Director Lance Pyburn said. The bike ride is known as “the longest annual charity bike ride in the world,” according to their website. PHOTO: This year’s Texas 4000 team entering Alaska for their final stretch. Since its creation 10 years ago, the organization has seen tremendous growth. To date, Texas 4000 has raised over $4.5 million. This summer, they have a team of 79 students split into three different routes — the Rockies, Ozarks and Sierra. This is the largest team in Texas 4000 history. Along their ride, the students give presentations to communities about cancer and how it can be prevented. Schutze said she hopes their ride makes people feel supported throughout their battle. “A bunch of college students willing to hear your story and fight for you and wanting to ride all the way to Alaska for you, I think it really gives people hope,” she said. On average, each rider raises over $6,800, but this year the average per rider was $7,600. Schutze alone raised close to $15,000. Pyburn described this year’s team as “fundraising power houses,” breaking all records in Texas 4000 history. All the proceeds go to grants for cancer research and support initiatives, and to the Texas 4000 program. Pyburn said the organization has historically given to MD Anderson Cancer Center and University of Texas at Austin Department of Biomedical Engineering. Throughout the program, participants do much more than just ride their bikes. “We jokingly say we’re a cancer fighting organization that happens to bike to Alaska,” Pyburn said. All three routes met up in Canada and will finish this year’s ride Friday in Anchorage. Schutze said she’s not quite ready for this year and a half long journey to be over. “I feel him every single day on the bike and I’m not ready to let that go,” Schutze said.